Glass paste is a material that traps air bubbles and takes a waxy, dull, semi-transparent and translucent appearance or looks like pumice in the light. It has a particular skin texture reminding of a peach with a velvety skin, a delicate skin similar to satin or the smoothness of a waxed surface. The light offers to the look a range of optical games thanks to semi-transparencies, modulation of colours, thickness of the material, carving in relief, cutting or polishing. An experimental laboratory on a human scale created by Jean-Michel Jobit, Designer & Founder of the Linea agency. A workshop which uses the glass paste and fused and pressed glass techniques, applied to Packaging Design. Specific tools dedicated to the artistic design of unique pieces or confidential sets. 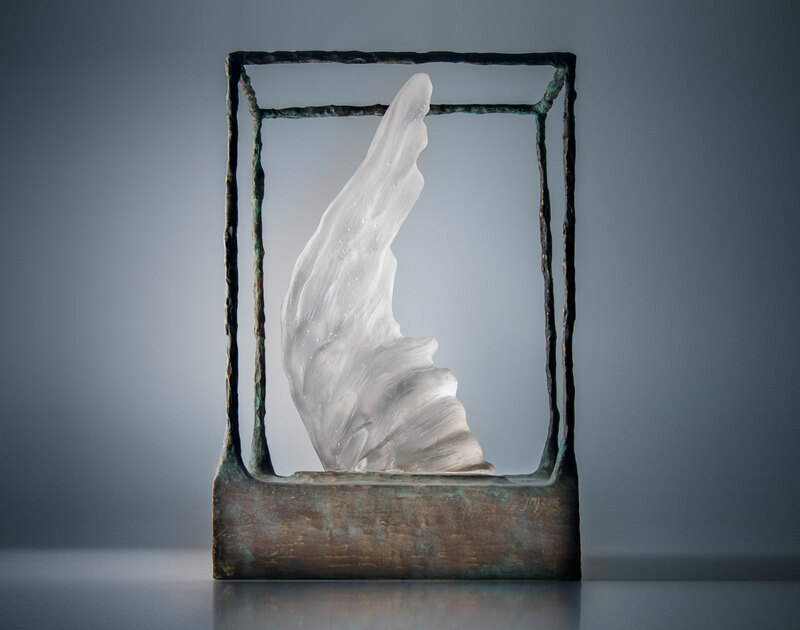 A sculpture in ‘Pâte de Verre’ and Bronze auctioned for 6000 € on the occasion of the 10th edition of La Part des Anges.